The Jaded Mage: Do You Have Faith or Are You Crazy? Do You Have Faith or Are You Crazy? Lately, I have noticed a new phenomenon. It's called Blind Faith in certain people. Gone are the days of having faith, trust and confidence in someone or something at a normal level, now we go all out and put certain people on pedestals as if they are Gods or Deities and whole heartedly believe they can do nothing wrong ever. Faith is complete trust or confidence in someone or something. Or a strong belief in God or in the doctrines of a religion, based on spiritual apprehension rather than proof. Now there is nothing wrong with a little faith or trust or even confidence in someone or even something. But when you cross the line, and think that a human being is God like or infallible, you have just lost your mind. As much as I abjure religion, I do not take away from people that do beleive in God and completely understand that they think he is infallible, but there is NO HUMAN, that ever walked the earth that is infallible. And if you are religious, and believe that any man or woman is infallible, I hope your God smites you! You know who I'm talking too! Definition of Blind Faith is to have unwavering faith in someone or something without true understanding, perception and discrimination. To have an unreasonable and unfounded trust and confidence in something or someone. Now doesnt that sound just a little CRAZY to you? You ARE a normal, rational human being aren't you? 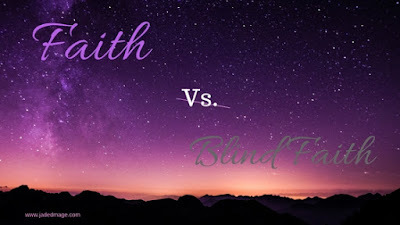 I was seeing this Blind Faith usually only when I would talk to the current POTUS fans, but recently, I'm seeing it from the other side too. But it has more to do with Party or core beliefs as opposed to person. I guess because I do not have Blind Faith in anything, I do not understand why anyone would have it. I think that a healthy dose of faith is always a good thing. As human beings we need to believe in something or sometimes someone and having high hopes for situations or people isn't really a bad thing. But it crosses a line when you think that beyond any doubt, your person, party, or idea is without fault or error. It is hubris to think that people will not or can not make mistakes. I think its time all of the moderate, balanced, idea driven people ban together. I wouldn't really call myself a Liberal, although I do fall slightly left of center and I would definitely not call myself a conservative, as I feel their ideals are too severe and restricting. But really all I have seen lately are people that are too far left and too far right. When I thought that I have seen the most left of leftist or the right of rightist, there is always someone that tops the most extreme on both sides. In ending, I am a firm believer in the middle, no crazy, no extreme. I also believe that the steely pendulum of politics certainly does swing from one side to the other, and with it currently at the height of the right, it will swing back, hard and fast to the left. So I would implore everyone to find a solid middle ground as I have done, as it's much easier to stand than to kneel.